If you’re unfamiliar with wheat berries, they are simply whole kernels of wheat — the same stuff that flour is made of when ground down. They’re a great source of fiber, and have a wonderful nutty flavor and hearty chew to them. 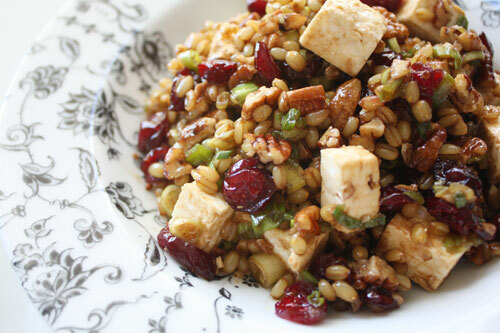 I have posted a recipe before for Wheat Berry Sunshine Salad, this is another variation with a totally different taste. Dressed with a simple balsamic vinaigrette, this no-fuss salad was a breeze to whip up, and really tasty. The cranberries added a touch of sweetness to the mix, and all the savory, tangy, crunchy, nutty components played nicely together. Top with some grilled tofu or chicken, and you have yourself a light, flavorful, fast meal! Added bonus: It’s a great make-ahead dish since the extra time allows the wheat berries to really soak up the vinaigrette. The cranberries will plump up nice and juicy too. 1. The wheat berries take about an hour to cook through, so you want to get these going first. Rinse the wheat berries, then, in a saucepan, combine them with the water and salt. Bring to a rolling boil, reduce the heat, cover and simmer for one hour or until tender. All the liquid should be absorbed. 2. Meanwhile prepare the vinaigrette by whisking together the balsamic vinegar, olive oil, mustard, and honey. Set aside. 3. 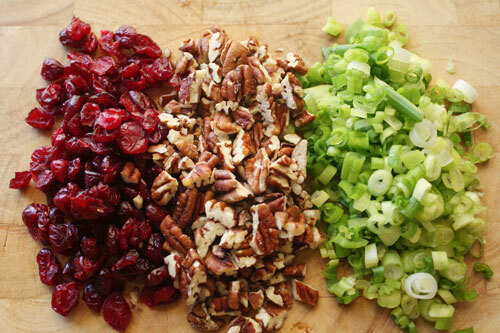 Combine the cooked wheat berries, green onion, cranberries, pecans, and feta. Dress with as much vinaigrette as you’d like. I use about ½ the amount this recipe makes. This entry was posted on August 15, 2010 at 7:35 am and is filed under Cooking, Family, Friends, People, Random, Recipe. You can follow any responses to this entry through the RSS 2.0 feed. You can leave a response, or trackback from your own site. Healthy meal with lots of fiber. Sounds delicious! I have never tasted wheat berries. I will have to change that now. Thank you for sharing, Amanda. Oh wow, your salad looks so good! Wheat berries are new to me too – I’ll have to look for them. I always have a problem with what to serve as a side dish for pork belly; it’s such a robust meat. I think this would be a perfect, light tasting solution. Thanks. in my mind, u r #1…. Another good recipe from Amanda. Thanks!